Three love messages could cost the perpetrator up to six months in prison. Colorado National Monument officials are asking for the public’s help in tracking down an individual responsible for bad poetry. 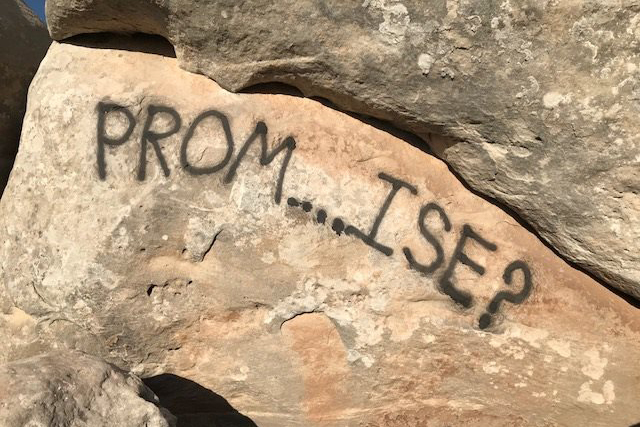 More specifically, authorities are after the person who vandalized a federally protected area by spray painting a prom invite and love missives. Last week, the Colorado National Monument posted pictures of the graffiti to its Facebook page along with a call for information. According to CNN, the messages were originally discovered by a nearby resident in late May. Authorities told CNN they must first analyze the vandalized area for any historic works of art before they can attempt to remove the messages. The person responsible faces a maximum penalty of six months in jail or a $500 fine. Officials ask anyone with information to contact the Colorado National Monument visitor center at 970-858-3617 ext. 360.